Since 1931 when Jaguar began making the first SSI cars and until the 1980s, every car that Jaguar made has been individually recorded with a hand-written entry in large ledgers. When this system was eventually abandoned in the computer age, these original ledgers were turned over to the Archive of the Jaguar Daimler Heritage Trust. Using these invaluable original records, the JDHT now offers owners of classic Jaguar and Daimler cars our Production Record Trace service. By completing a downloadable form, you can apply for a Heritage Certificate for your car. A JDHT Heritage Certificate is a Certificate that gives all the relevant information on your car taken from the original records. It will confirm the original numbers and colour scheme, give the dates of build and dispatch, as well as the original destination of the car. 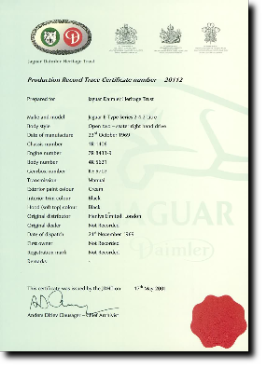 Where recorded, the name of the first owner and the original registration mark are also included on the Certificate. JDHT offer this service for all cars that are more than ten years old. (there is also some information available for some earlier Daimler cars, from circa 1953 onwards). This is a very useful addition to your vehicle history file and if you are interested in obtaining a certificate click the certificate to link to their site, where you will find a downloadable form and details of costs.